The library aims to support the curriculum and the students’ work and to promote reading for pleasure and information. It also promotes the acquisition of information skills to enable students to become independent and life-long learners in an information age. Monday – Friday 8.40 a.m. – 5.00 p.m.
Online public access library catalogue on laptop. Beaufort students are welcome to browse the shelves, to borrow books, search the Internet, or to spend time in study or work preparation. 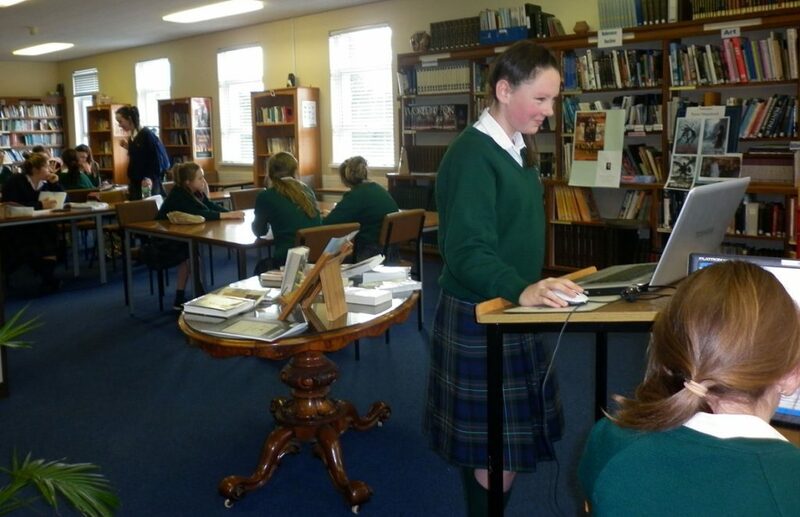 Regular library activities include bookclubs, author visits and research and information sessions. There is a thriving reading culture in Loreto Beaufort. The reading lists which are linked to here are just a sample of popular books which are in the library. They have either been recommended by the students, the librarians, teachers, or authors who have come in to speak to our students. We hope you have the pleasure of getting to read some of them.